St. Patrick’s Day will be celebrated on Monday, March 17, 2008, honoring the feast day and date of death of the priest and patron saint of Ireland, who died on March 17th around 460 C.E. The first St. Patrick’s Day parade actually took place not in Ireland, but in New York City on March 17, 1762. Kilted bagpipers and drum corps drawing enormous crowds (a few years ago, we joined them to see both a kilted Sean Connery and a suited Mayor Bloomberg march). These days the holiday is celebrated not just by people of Irish descent, but people of all backgrounds, in the United States, Canada, Australia, and even in countries where there is no Irish population, such as Japan, Russia and Singapore. In Ireland, St. Patrick’s Day was traditionally a religious holiday (pubs closed). But in 1995, the government decided to use St. Patrick’s Day as an opportunity to drive tourism. It is now a multi-day celebration featuring parades, concerts, fireworks and other attractions. 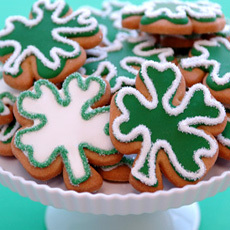 Bake shamrock cookies for a St. Patrick’s Day treat. Photo courtesy Eleni’s. Corned Beef And Cabbage and Irish Soda Bread are some of the favored treats of the day, along with Irish beer, Irish Cheddar, Irish Coffee and anything green—from bagels and beer to broccoli soup and green-tinted chocolate chip cookies (add 1-1/2 teaspoon green food color to your favorite recipe). Our own NIBBLE celebration focuses on food and drink, starting with a selection of sweets you can order for gifts, a St. Patrick’s Day party, or just to treat yourself and your family. Take a nibble of our recommendations. 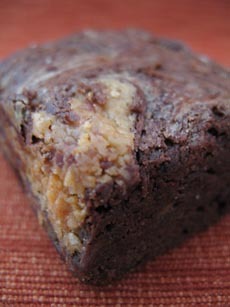 The Exceptional Brownie’s Peanutty Swirl is one of the dairy brownies. The Exceptional Brownie, which produces its brownies under a kosher-dairy certification from KOF-K, is producing some of its flavors under a kosher-parve certification from the Orthodox Union. With the 15% annual growth of the kosher food market, company founder Claire Sauerhoff reports that the need existed to produce both a dairy brownie (made with butter) and a parve brownie (made with margarine). People who observe kosher dietary laws do not eat dairy products with meat products; there is a six-hour waiting period after meat has been consumed before dairy-based products can be consumed (including even a bit of milk in tea or coffee, or any dessert that contains butter, cream, cream cheese, sour cream or other dairy product). Now, with the dual choice from The Exceptional Brownie, people who love all-butter baked goods can plan their days (brownies and blondies for breakfast? ), and people who want a brownie after a meat-based breakfast or lunch can munch away on the parve version. Both recipes use premium chocolate, real vanilla and other top ingredients. Read our review of The Exceptional Brownie, whose dairy brownies are available in Berry Nutty, Blondie, Butterscotch Blondie, Espresso Choco-Chip, Double Chocolate, Peanutty Swirl, Raspberry Swirl and Walnut Double Chocolate. The Exceptional Brownie’s Walnut Double Chocolate Brownie was the winner in a national competition sponsored by COPIA, the American Center for Food, Wine and The Arts, founded by Julia Child and Robert Mondavi (among others) in Napa Valley. The parve brownies are available in Double Chocolate. Find more of our favorite brownies in the Cookies & Brownies Section of THE NIBBLE online magazine. It’s National Peanut Butter Lover’s Day—and starting Monday, our Gourmet Giveaway Trivia Quiz focuses on peanut butter. So, all you lovers, tune back in then and you can win a delicious peanut butter prize. We’re a little constrained here about what we can write about peanut butter, because most of the juicy insights are questions in the trivia quiz. So instead, we’ll talk about flavored peanut butter.There isn’t yet a National Flavored Peanut Butter Day, because all of these “designated holidays” are petitioned by large companies or their public relations firms, and flavored PBs are often made by smaller, artisan companies that don’t have the bandwidth for such initiatives. So, we’ll do a little horn-tooting here for them. 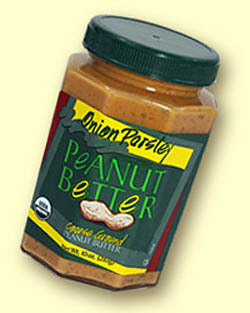 Try Onion Parsley Peanut Better on a roast beef or turkey sandwich, instead of mustard or mayo. Our first flavored PB epiphany came when we tasted the Peanut Better peanut butters at the Fancy Food Show in the summer of 2004. Imagine seeing a lineup of jars called Onion Parsley Peanut Butter, Rosemary Garlic Peanut Butter, Thai Ginger & Red Pepper Peanut Butter and Spicy Southwestern Peanut Butter. We could almost imagine the latter two, because we’ve made our share of spicy Szechwan noodle dishes. But Onion Parsley? Rosemary Garlic? After one bite, we were astounded, and Peanut Better quickly became a Top Pick Of The Week. (The company also makes Cinnamon Currant, Deep Chocolate Peanut Praline, Sweet Molasses & Vanilla Cranberry and other sweet and savory flavors. And, the line is organic and kosher. )A short while later, in January 2005, we were at the Winter Fancy Food Show in San Francisco and discovered P.B. Loco, a company founded by law school graduates in St. Paul, Minnesota. Their Sun-Dried Tomato Peanut Butter knocked our socks off, and two of their numerous sweet PBs—Raspberry White Chocolate and Sumatra Cinnamon & Raisin—remain our all-time favorites (who needs dessert—just dip in a spoon). But back to those exotic savory peanut butters: What do you do with them? They are dynamite on turkey, chicken, ham, roast beef and grilled vegetable sandwiches (pair them with soft cheeses like mozzarella, too). Use them to baste chicken or lamb, mix some into meatloaf, stuffing, bread and muffin batter. Spread them on apples or pears. 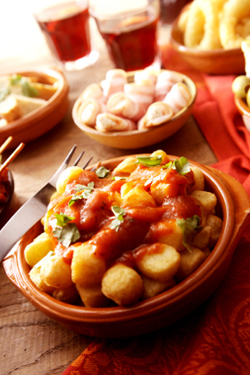 Make canapés, along with meats, cheeses or vegetables. 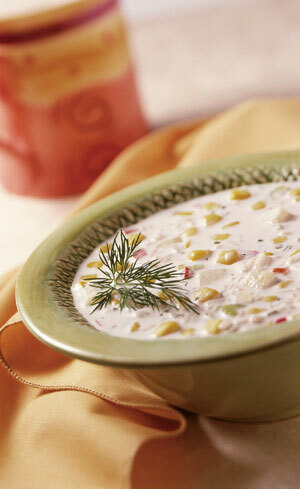 Dip crudités into them, toss them with steamed vegetables, add them to baked potatoes. Go [pea]nuts! Read more about PB in the Jams, Jellies & Peanut Butters Section of THE NIBBLE online magazine.